Prospecting for Gold Near Washington, DC. Virginia and Maryland, especially near Washington, DC. No, I am not referring to the "fool's gold" often found near Pennsylvania Avenue. This page is about the real gold that can be found in streams and rivers only a few miles from the White House. What is the history of gold mining in Virginia and Maryland? Where can you go to find gold and see old gold mines? What kind of equipment do you need, and where can you get it? What should you expect to find? Please send your comments, and I will try to incorporate improvements and corrections into these pages. See for latest page updates. Gold and Other Minerals of Rock Run, Montgomery County, Maryland by Jack Nelson, from Mineral News, Vol. 16, No. 3, March, 2000. A tale that's as good as gold By Maria Longo-Swiek in the Montgomery Miscellanea, Summer 1999 Issue. Gold in Maryland by Karen R. Kuff, Maryland Geological Survey. A Brief Description of the Geology of Maryland from the Maryland Geological Survey. Map: Great Falls Gold District (1953) from the Maryland Geological Survey. CVGP Central Virginia Gold Prospectors. 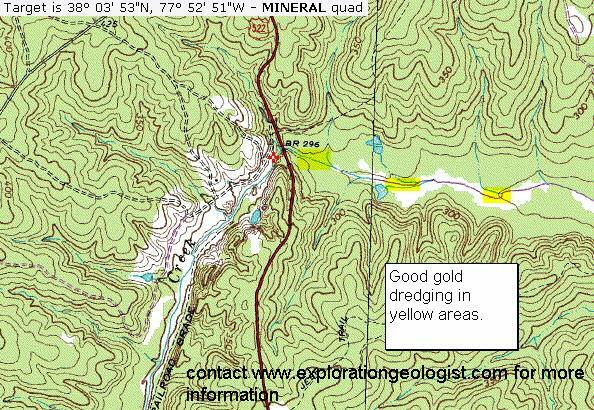 VA-GOLD has pictures, videos and discussion about East Coast gold prospecting. Gold Mining in Virginia from the The History of Gold by A.B.J. Hammett, Chapter VIII, 1966. Gold in Virginia Virginia Division of Mineral Resources (DMR), Department of Mines, Minerals and Energy. VA Gold Maps from The Exploration Geologist of Swinks Mill (near Great Falls), and Contrary Creek in Lousia County. Goldvein, VA Gold Mining Camp Museum. VA gold panning sites along with other Southern states. Collecting in Virginia, Spring, 1998 By Tom Tucker - from the November 1998 issue of the Mineral Mite, the newsletter of the Micromounters of the National Capital Area in Washington, D. C.
Virginia & Maryland Gold Locations from Recreational Gold Prospecting - panning at Scotts Run near Great Falls, VA.
Virginia Gold Mines, Prospecting, Panning, Treasure Hunting and Rockhounding from GoldMaps.Com. Gold Prospectors Association of America (GPAA) includes forums on prospecting, equipment and tips. Newsgroup: alt.mining.recreational (may include spam). Gold: What is it? Hints and Tips. Stuff You Can Build. Tools of the Trade. Clubs. How to Find Gold. Information Resources. Recreational Gold Prospecting. Hints and Tipson prospecting equipment and techniques. The Basics of Prospecting by Gold Prospectors of Colorado. Information on Prospecting and Prospecting for Gold in the United States from the U.S. Geological Survey (USGS). How to Mine and Prospect for Placer Gold 1971 Bureau of Mines publication. Gold Prospecting Links by GoldMaps.Com. Gold Panning Instructions by The New 49'ers. How to Pan by Keene Engineering. Sluicing for Gold by Keene Engineering. Prospecting Tips from the Georgia Gold Prospectors Association. 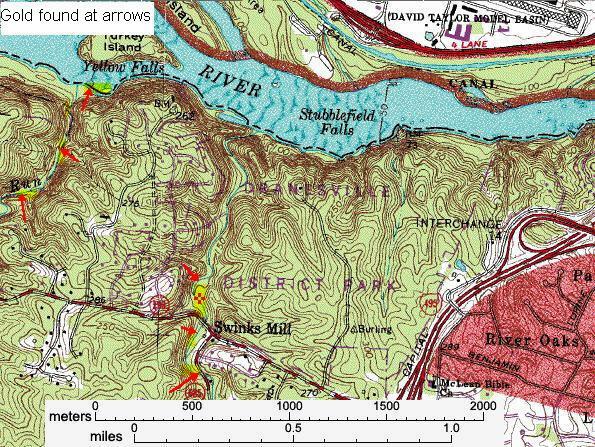 TopoZone.Com generate online topographic maps - this one shows Goldvein, VA. Please send suggestions for links to include here. Gold in Virginia by Palmer C. Sweet, 1980, 77 pages, Virginia Division of Mineral Resources, Publication 019, available as a free download, or as a printed copy for $6.00, P.O. Box 3667 Charlottesville, VA 22903, Telephone : (804) 951-6340 FAX : (804) 951-6365, Office Hours : 8:00 AM - 4:30 PM Mon - Fri.
Topo Maps Virginia Department of Mineral Resources. Publication 147: Metallic Mines, Prospects and Occurrences in the Gold-Pyrite Belt of Virginia available as free download, or as a printed copy from the VA DMME. Fairfax Gold Fever by Walter A. Goetz, 1984, 35 pages, includes bibliography, available for $8.00 plus postage from Walter Goetz, 9107 Kirkdale Road, Bethesda, MD 20817, phone (301) 530-7462. Maryland Gold Fever by Walter A. Goetz, 1979, revised 1996, 50 pages (8 1/2 x 11) including foldout map of mines and locations, plus 5 pg. bibliography, available for $10.00 plus postage from Walter Goetz, 9107 Kirkdale Road, Bethesda, MD 20817, phone (301) 530-7462. Montgomery Gold Fever by Walter A. Goetz, 1988, 54 pages (8 1/2 x 11), foldout map, plus 5 page bibliography, available for $10.00 plus postage from Walter Goetz, 9107 Kirkdale Road, Bethesda, MD 20817, phone (301) 530-7462. Minerals of the Washington, D.C. Area by Lawrence R. Bernstein, 1980, 148 pages, Maryland Department of Natural Resources, available for $5.00 at the MD DNR office and $6.00 postage paid from MD DNR, phone (410)554-5500. Map: Gold Mining in the Great Falls of Maryland (circa 1898) by Walter A. Goetz, 1975, 1 page, available for $1.50 plus postage (New 2009 Digital printing, folded) from Walter Goetz, 9107 Kirkdale Road, Bethesda, MD 20817, phone (301) 530-7462. Maryland's Geology by Martin F. Schmidt, Jr. (1993), available from Amazon or Cornell Maritime Press/Tidewater Publishers; P.O. Box 456, 101 Water Way; Centreville, MD. 21617; (410) 758-1075 or (800) 638-7641, fax: (410) 758-6849. $24.95. ICMJ The Premier Magazine for Miners and Prospectors. Doc Copper links to books on gold prospecting. Earth Science Books Online recommended by the Maryland Geological Survey. BookFinder.Com search for used books. BestBookBuys search for best deals on new books. Gem and Mineral Clubs / Societies In Virginia. Washington DC Area Rock, Mineral, and Fossil Clubs. Calendar of Events for Rock, Mineral, and Fossil Clubs in the Washington DC Area. Gem & Mineral Hunters of Virginia of Prince William County. AMFED American Federation of Mineralogical Societies. - Visited the Goldvein VA Gold Mining Camp Museum and talked with Steve Hummer who runs the museum for Fauquier County. They may have a gold panning workshop this summer. Neva Trenis, a writer for the Fredericksburg paper was there working on an article about the museum. The article appeared in the Sunday, February 04, 2001 Free-Lance Star but it is no longer posted online. - Went gold panning with Jack Nelson in Rock Run near Potomac, MD. Jack has taught hundreds of folks to pan, and I found some flakes in every pan. It was a beautiful day in the 50s but the water was cold enough to require waders and waterproof gloves. - Went to the CVGP meeting and got a tour of Contrary Creek near Lake Anna in Louisa County. - Stopped by Contrary Creek for an hour of panning in the evening, and the next morning went to Rock Run with Jack Nelson for a couple hours of panning. - Panning trip to Cotton Patch Mine near New London, NC. Nice gold flakes! - Several trips to Rock Run near Potomac, MD, usually with Jack Nelson and his buddies. - Trip to the Mojave desert to take a lesson on prospecting for gold with a metal detector from Mojave John. - Prospecting trip on the Yukon River from Whitehorse to Dawson: The Snakepit or Bust. Scotts Run near Great Falls, VA; Byrd Creek in Fluvanna and Goochland Counties, Willis Mountain in Buckingham County, Horsepen Run in Stafford County, Yellow Falls on the Potomac near DC, United States Mine near the junction of the Rapidan and Rappahannock rivers, Culpeper Mine near Mine Run in Culpeper County, Rappahannock River level near Fredericksburg, Clore Brothers Outfitters canoe trips on the Rappahannock river. Lovin Gold Mining Supplies Store, 1082 Main St. (Rt 15), downtown Dillwyn, VA.
Black Cat Mining mining equipment, books and maps. Deserdog's Gold Sucker for extracting gold from crevices. The Prospector Store: metal detectors, sluices, pans, dredges, etc. eBay auction site for almost anything. Keen Engineering manufactures portable mining equipment. Prospecting Supply Outlets by State The Gold Miners Headquarters. East Coast Prospecting and Mining Supply in Ellijay, Georgia. RC Gold Prospecting Supplies in Bellingham Washington. Absolute Clarity Optical Sales, Service & Repair (microscopes for micro-mineral viewing). Cabela's waders and other outdoor sports supplies. ScienceLab lab equipment and chemical supply. I would like to use a metal detector for finding gold in VA and MD, but I have not heard of much success with this technique. Please let know if this is a good idea. I am also interested in building my own detector, and there are links below to detector designs and theory. Please let know if there are better designs that I have not included here. Whats the best gold prospecting metal detector? from MetalDetector.COM. Chuckwagon Charlie's Gold Prospecting with a Metal Detector. Find Electronics: Metal Detecting Forum Index. The Electronic Prospecting Page: Gold Nugget Detectors. Nugget Hunting, Search Coils, and Coin Versus Nugget Detectors by Gold Prospectors of Colorado. from the Prospecting Page of the On-Line Treasure Hunter. KellyCo Detectors discount metal detector dealer. Gold Prospecting Metal Detector Workshops: hands-on instruction. Equipment Information Page and The Equipment Exchange from The On-Line Treasure Hunter. Pinpointing With Your Detector: tips on locating objects. Where Can You Metal Detect? tips on where it is legal. Metal detectors: Theory and Design projects you can build. Random Walk or Grid Pattern? optimum detector search patterns. Theoretical and Practical Considerations in Metal Locator Design. NuggetHunting.Com Metal Detecting for Placer Gold Deposits. Modern Metal Detecting, Revised 429 pages, by Charles Garrett. You Can Find Gold With a Metal Detector 135 pages, by Charles Garrett. Zip Zip : Mastering Your Nugget Detector 153 pages, by Larry Sallee. Cubic Garnets Found in Maryland and Virginia Streams By Jack Nelson, Canadian Rockhound Geological Magazine, Winter/Spring 1999. Virginia Rocks and Minerals, Field Trips, and Mineral Links from the Virginia Earth Science Resource Page. Virginia Interactive County Mineral Map from A Virginia Rockhounder's Web Site. Morefield Mine in Amelia, Virginia - gem collecting. Collecting Minerals, Rocks & Gems in Virginia. Wikipedia: Willis Mountain Buckingham County Virginia - kyanite mining. Geology of the Sideling Hill Road Cut by the Maryland Geological Survey. Calvert Cliffs, MD - Marine fossils in cliffs exposed on the western shore of the Chesapeake Bay - Maryland Geological Survey. Fossil Collecting Sites at Calvert Cliffs from the Maryland Geological Survey. Miocene Shark Teeth - description of fossil shark teeth found in the Calvert Cliffs formation - Maryland Geological Survey. Fossils in Counties of Maryland from the Maryland Geological Survey. On-line Pamphlets, FactSheets and More... from the Maryland Geological Survey. Doc Copper links to gold in the Eastern US. West Virginia Geological Survey There has been no native gold or native silver recognized to date in West Virginia. GPAA of PA Delaware Valley Chapter. Gold in South Eastern Pennsylvania by Geologist Jeri Jones. Cotton Patch Mine near New London, NC. Found some nice gold flakes in Fall of 2001! Reed Gold Mine North Carolina. Dahlonega Courthouse Gold Museum Georgia. NE Texas GPAA club pages. Worldwide Mineral Collecting Mineralogy Club of Antwerp, Belgium. As the Trommel Turns gold mining stories and more. Halide Leaching and Recovery of Gold. Plus other secrets of Basement Chemistry for Gold Prospectors by A. K. Williams. Tom Ashworth's Prospectors Cache with great Links and forums. RareMaps.Com Old maps of the US Mid Atlantic. Earth Science World Lecture Hall. My Business Page: Infiltec Air Leakage Control. My Fun page: jokes and pictures from trips. My Seismograph page: how to build a seismograph. Join the SETI@Home search for extraterrestrial intelligence. Here are my statistics. Please join my team Dickster. Join the Einstein@Home search for gravitational waves. Here are my statistics. Please join my team Dickster. Join the Predictor@Home predict protein structure. Here are my statistics. Please join my team Dickster. Join the SIMAP@Home compute Similarity Matrix of Proteins. Here are my statistics. Please join my team Dickster. Join the Rosetta@Home determine the 3-dimensional shapes of proteins. Here are my statistics. Please join my team Dickster. My SID-GRB@home page: how to build a simple VLF radio receiver that can detect Gamma-Ray Bursts (GRB) from the edge of the universe. My Infrasound@home how to build an inexpensive microbarograph for detecting infrasound(sounds below 20 Hz). This page copyright © 2001-2012 by , and it was last updated on February 07, 2012.